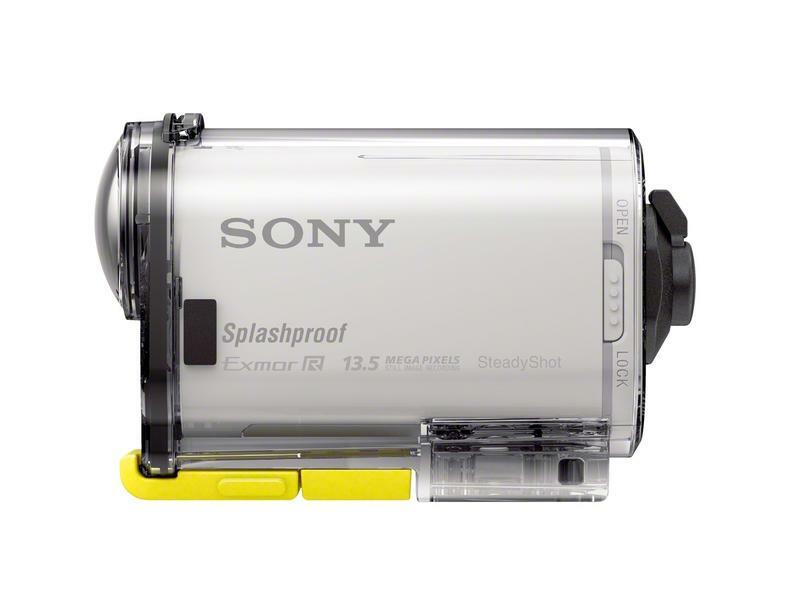 Sony is once again ready to test the action cam waters by introducing some major upgrades in its new HDR-AS100V (we’ll just call it Sony Action Cam 2014), which comes with full HD image capture and the added benefit of high-quality still capabilities. Not one to simply sit back while GoPro runs away with the point-of-view market, Sony is really hunkering down to bring its own spin on action cameras, adding even more enhanced image stabilization and, as par for the course, the ability to share without the need for wires. 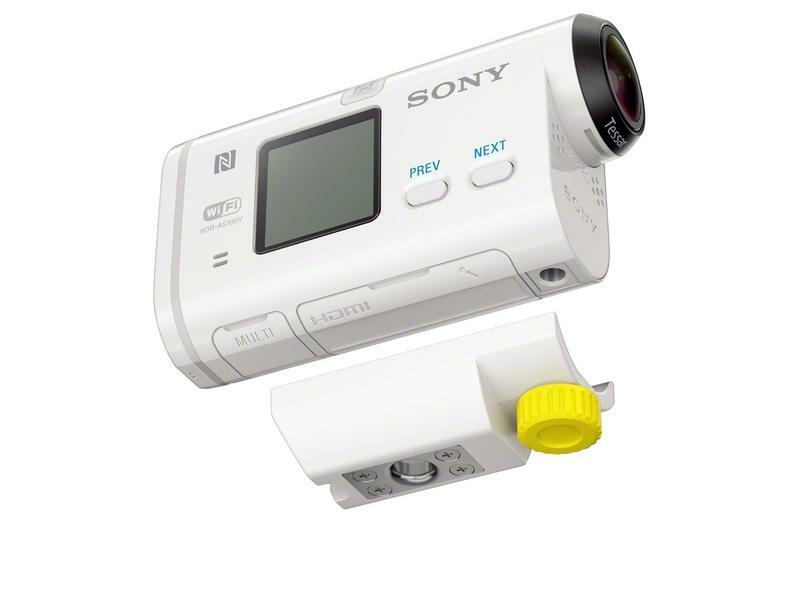 Equipped with Sony’s now famous BIONZ X processor, Sony’s new action cam allows for Full HD in XAVC S, which is essentially a consumer-friendly format based on the XAVC codec developed for 4K professional use—at up to 50Mbps, Sony said. That means motion should, in theory, be extremely smooth, and obviously insane high resolution to show off all your best roller blading moves. Sony said the new model also supports 1080/240p, 720/120p or even 720/240p to really slow the action down. As for the photo mode, the camera is capable of capturing 13.5-megapixel still images, and there’s also a time-lapse function at 2-megapixels. 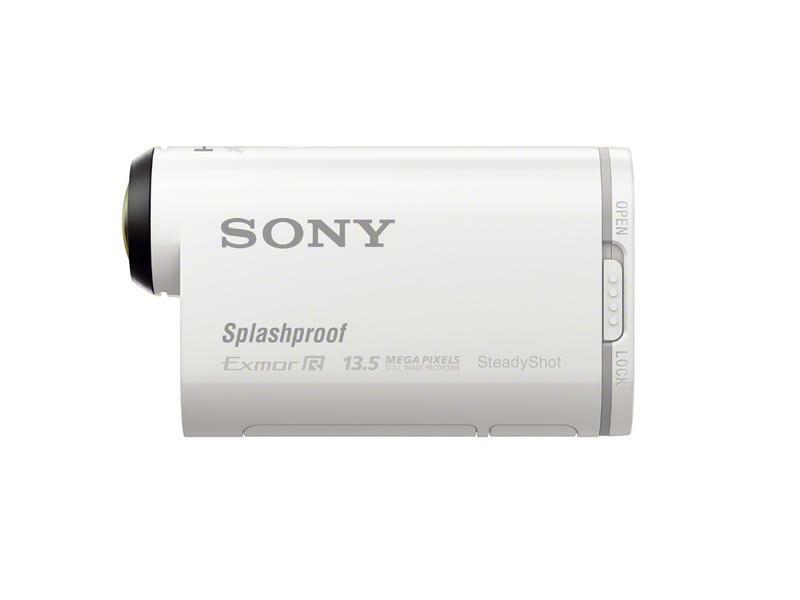 In the newest model, Sony is emphasizing the AS100V’s splash-proof body, so users will be able to (lightly) brave the elements without a waterproof case, which is actually supplied anyway. The design is similar to Sony’s first effort, so there’s not much to say there, though it’s worth noting that the white color does look quite nice. 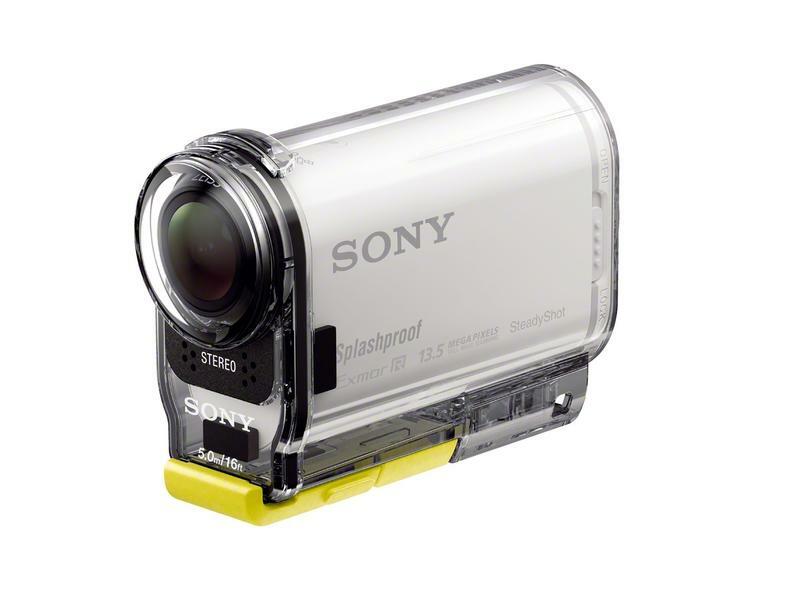 The technology inside Sony’s new action cam is just as impressive. The company promises its new image stabilization is capable of adjust for different frequencies of vibration, meaning it knows when you’re simply walking down the street or riding a dirt bike. Everything is captured through a ultra-wide (170-degree) ZEISS lens, which should make your trips down the slope look quite nice (assuming you can stay on your feet). Users can also manually change color settings “for extra creative flexibility when editing footage,” Sony said. And for you directors, the AS100V also has the ability to record video with a time code for easier synchronization. As mentioned, the new action cam has NFC and Wi-Fi capabilities, so you’ll be able to beam content straight to your smartphone—there are apps available for both Android and iOS, so plenty of users will be able to get in on the fun. 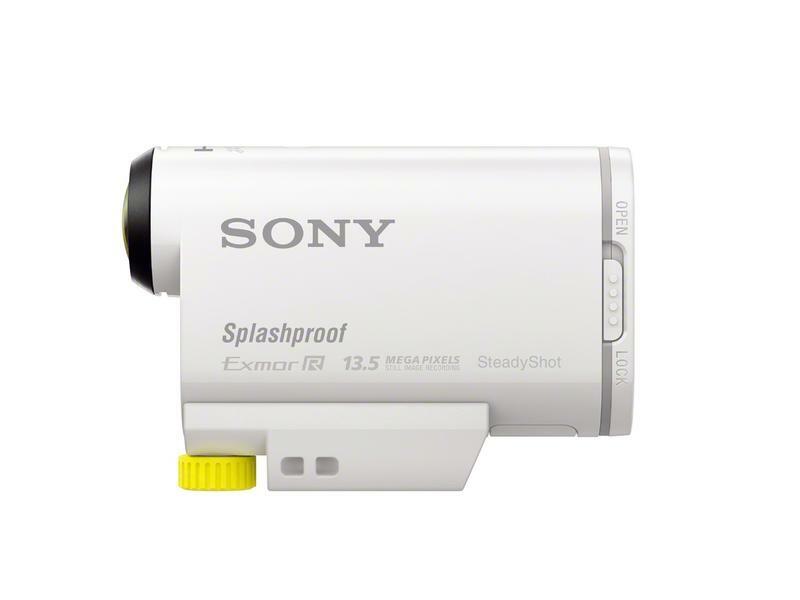 Sony also said a live streaming capability will be added to the camera, though that won’t roll out until summer 2014. There’s a variety of apps to go along with the AS100V, such as a new tripod adapter, Action monopod, Hard Lens protector, Camera leash pack, and more, counting 26 mounting attachments in all. Sony’s latest action cam can be pre-ordered today, and will hit retail stores in March for $299.99; the current model will soon be offered at a reduced price. You can also choose a bundle, which will include the camera and Live View Remote for $399.99.